← Just three weeks to go! If this is your first time attending this show, you are in for a treat! You will see hundreds of quilts displayed throughout the park, contributed by quilters from all across GTA and the province, as well as a sprinkling from further away too! There are trunk shows to attend, vendors and a marketplace to tempt you, and this year we will have a food truck from The Gourmet Gringos, as well as an ice cream truck to help keep you cool. AND tomorrow we can all start checking the long range weather forecast.. fingers crossed! Jane, Shirley, Judy and Valerie are BUSY behind the scenes getting everything ready for the show- thanks to all of you who have volunteered to help at the show, and those who have submitted quilts. What would we do without those quilts?? 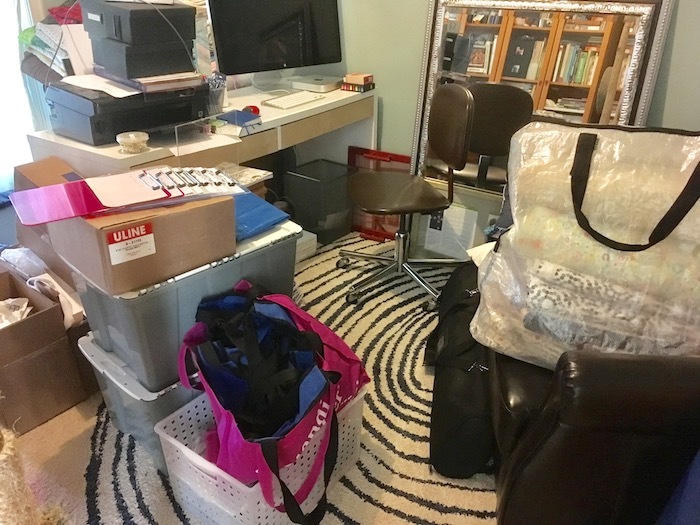 And this is one corner of my office.. overflowing with forms, bags, labels, quilts, and all the other things we need to make this show happen. Workshops: Have you signed up for a workshop yet? There is still time, so clear some space in your calendar and sign up today! We are still honouring the 2 for 1, so if you sign up for one full day class you can then sign a friend up for free, or yourself for a second class. Email Valerie with the info for the free class, as you cannot do that online. Sign up for classes and/or trunk shows here. Cheryl Arkison: class descriptions and supply list here. Tamara Kate: class description and supply list here. Saturday Trunk shows: Tickets for trunk shows on Saturday with Tamara Kate (11:00 am) and Cheryl Arkison (3:30 pm) are $10- each online here. IF there is space remaining on Saturday, you may purchase a ticket at the door. Bill started sewing- and making quilts- when he was laid up with a serious leg injury and needed something to distract himself from the pain. He never stopped and now has close to 70 quilts under his belt.His quilts tell a story- part of his own personal life story. Bill is one busy man- he continues to learn, play and work on his craft, he takes a wide variety of workshops, gives presentations and is a member of numerous guilds and quilt groups. His quilts have been exhibited in juried and non-juried shows in both Canada and the USA. Don’t miss his talk- he is a very enthusiastic and outgoing quilter with a great story to tell. Ana Paula is a professional visual artist. She graduated in fine arts studio and photography in Brazil, and has a passion for the arts, textile art, art quilts and handcrafts. Currently, she’s working with textile arts to express the happiness of life. She has been teaching and lecturing since 1988. In the early 90’s her art work could be found in magazines and on TV in Brazil. Currently living in Canada, Ana Paula exhibits her work here and abroad, sharing her art knowledge and love of craft. This year there are 20 quilts made by Ana’s students on display as part of Quilts at the Creek. Note: All trunk shows take place at theTown Hall, which is located facing on the village green.